Just Opened Check out what has opened near you! 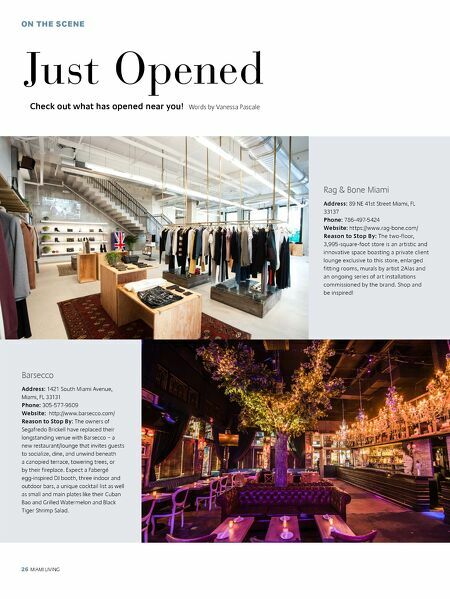 Words by Vanessa Pascale Rag & Bone Miami Address: 89 NE 41st Street Miami, FL 33137 Phone: 786-497-5424 Website: https://www.rag-bone.com/ Reason to Stop By: The two-floor, 3,995-square-foot store is an artistic and innovative space boasting a private client lounge exclusive to this store, enlarged fitting rooms, murals by artist 2Alas and an ongoing series of art installations commissioned by the brand. Shop and be inspired! Barsecco Address: 1421 South Miami Avenue, Miami, FL 33131 Phone: 305-577-9809 Website: http://www.barsecco.com/ Reason to Stop By: The owners of Segafredo Brickell have replaced their longstanding venue with Barsecco – a new restaurant/lounge that invites guests to socialize, dine, and unwind beneath a canopied terrace, towering trees, or by their fireplace. Expect a Fabergé egg-inspired DJ booth, three indoor and outdoor bars, a unique cocktail list as well as small and main plates like their Cuban Bao and Grilled Watermelon and Black Tiger Shrimp Salad.